To reduce problems of diffuse skin redness and minor rosacea, Avene Dermatological Laboratories have specially developed the Antirougeurs Redness Relief, the replacement range for the Anti-Redness creams. 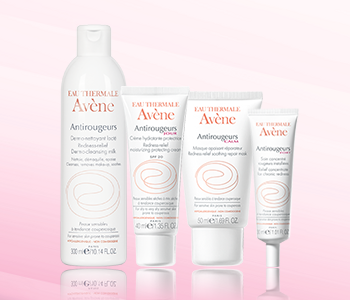 Regular use of Antirougeurs Redness Relief products, with Avene Thermal Spring Water, helps to prevent and reduce red blotches in sensitive skin. Day after day, it recovers its natural softness and smoothness. Diffuse skin redness is therefore visibly reduced and transient flushes are less frequent.